In a dry skillet or heavy frypan over medium heat toast chiles, coriander seeds, cumin seeds, fennel seeds, cardamom seeds and whole cloves. Toast for only a few minutes until the spices begin to release their fragrance. Using either an electic spice grinder or a mortar and pestle, grind the chiles into a powder first then set aside. Now grind the remaining spices together. (Grind in batches for a few minutes each time.) 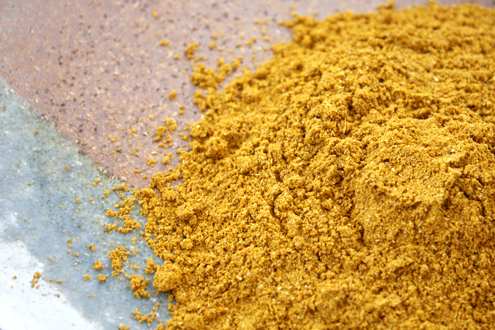 Place all ground spices in a small bowl and stir in turmeric and cinnamon. Sift through a medium-fine sieve to remove any clumps. Store what you don’t use in an airtight container.